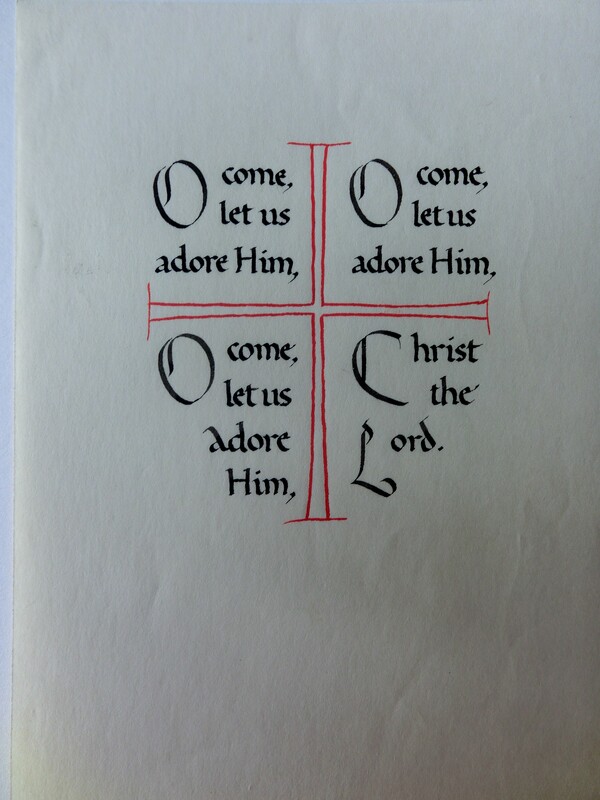 This delightful little book was written by calligrapher and illuminator Graily Hewitt (1864–1952). 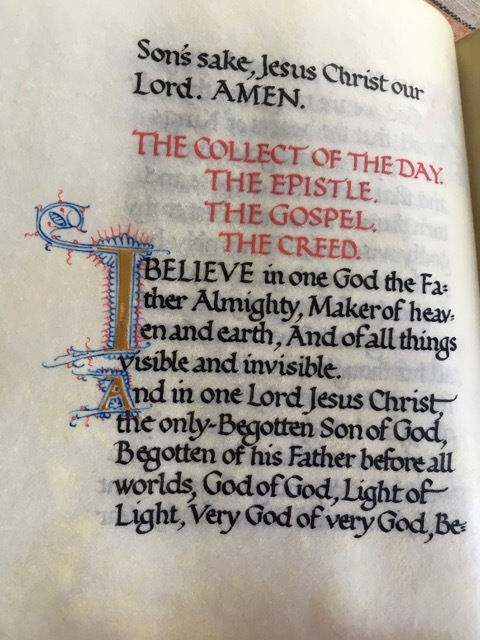 It’s the text of the Holy Communion written out for Clairice Gabbatt who lived in Petersfield. 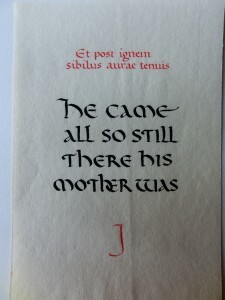 The book is in Graily Hewitt’s typical lettering style and it’s likely to be on his usual preferred writing surface of parchment, as the leaves are quite thin. 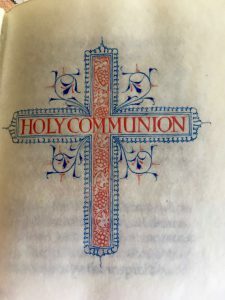 The book is bound in a dark leather with a gilded cross, and vine leaves and bunches of grapes in each corner (from ‘I am the vine, you are the branches’, John 15:5) and this image also gives an indication of size. 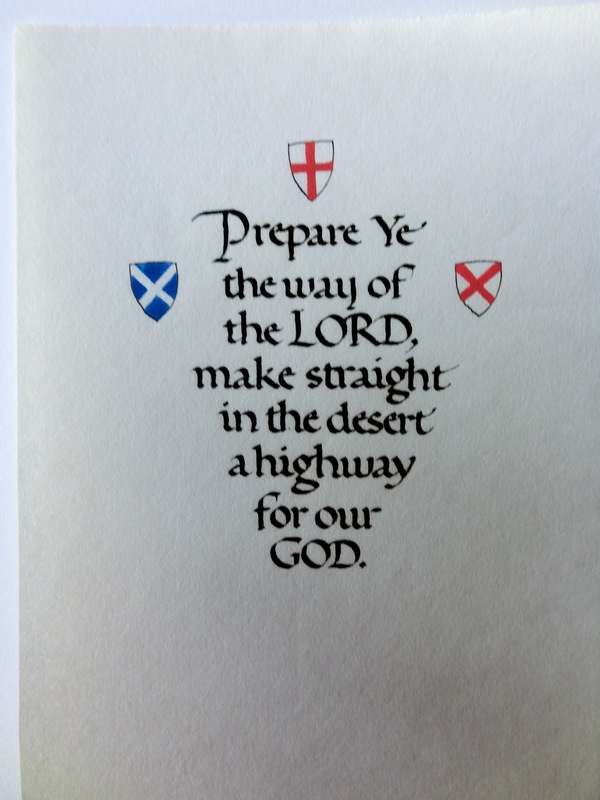 Graily Hewitt’s lettering is always very strong, it was said that he was the best calligrapher in the UK after Edward Johnston. 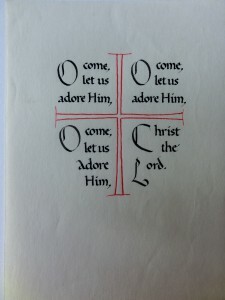 Interestingly he almost always chose to write on parchment which is not the most pleasant surface to write on and results in letters that are not as crisp as they can be on well-prepared vellum.The enlarged and gilded letter ‘O’ is delightful and that, and the enlarged ‘A’, are surrounded by fine line decoration similar to that in the De Brailes Hours. 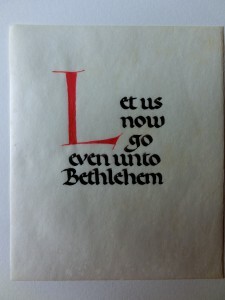 Calligraphers working at the turn of the last century were less concerned about word breaks. Nowadays most scribes wouldn’t break the word ‘Father’ in the first line to ‘Fa’ and ‘ther’ on the second, and again the word ‘Because’ split not just between two lines, but ‘Be’ on one page’ and then ’cause’ on the next. If you want to see more of Graily Hewitt’s work, then a previous web post is here. My great aunt Clairice Gabbatt and her husband lived in an Arts and Crafts house in Petersfield. They had no children and Clairice was worth a considerable fortune as she was a member of the Hartley’s Jam family. They were religious (and a bit stuffy) and became lavish benefactors of their church, St. Mary’s Liss. Clairice and her friend Lady Maufe (a director of Heals) wife of Sir Edward Maufe the architect who designed Guildford Cathedral furnished the church with fabrics from Liberty and Heals and bought all the vestments etc. Percy Gabbatt seemed to domineer all the goings on at the church and any renovations etc (which he paid for) so tongue in cheek, the locals referred to the church as St. Gabbatt’s. They donated a wonderful porch statue called Incarnation made by friend Eric Gill and he and Gwen Reveratt and Graily Hewitt, I am led to believe, were all friends. Graily Hewitt was commissioned to do the Baptismal roll in the church. In a church magazine I have, he was mentioned as living in Petersfield. 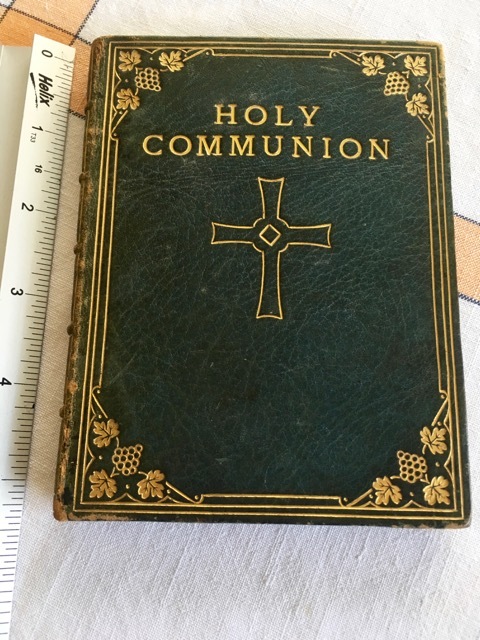 However this little Holy Communion book refers to Treyford. Treyford is not far from Petersfield. Many thanks to Jenny for supplying the photographs and the background. 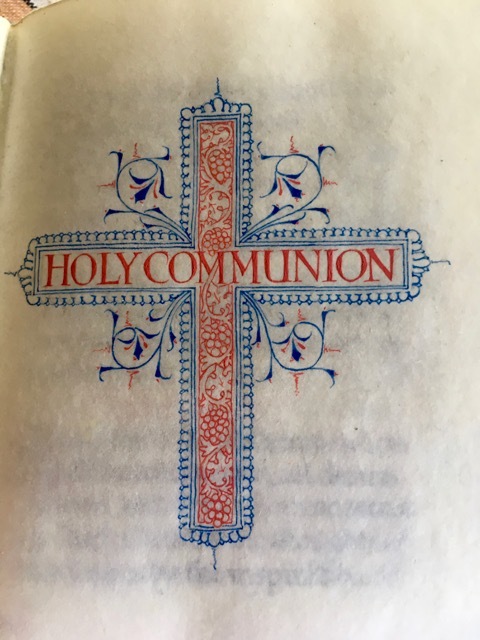 This entry was posted in Blog, Interesting stuff, Manuscripts and tagged calligraphy, gold, Graily Hewitt, Holy Communion, manuscript book, parchment on 10 May 2018 by Patricia. Graily Hewitt was a truly great craftsman. Not only did he write the ‘Illuminating’ section in Edward Johnston’s seminal work ‘Writing & Illuminating, and Lettering’ but his work is astonishingly fine, particularly his gilding on gesso. 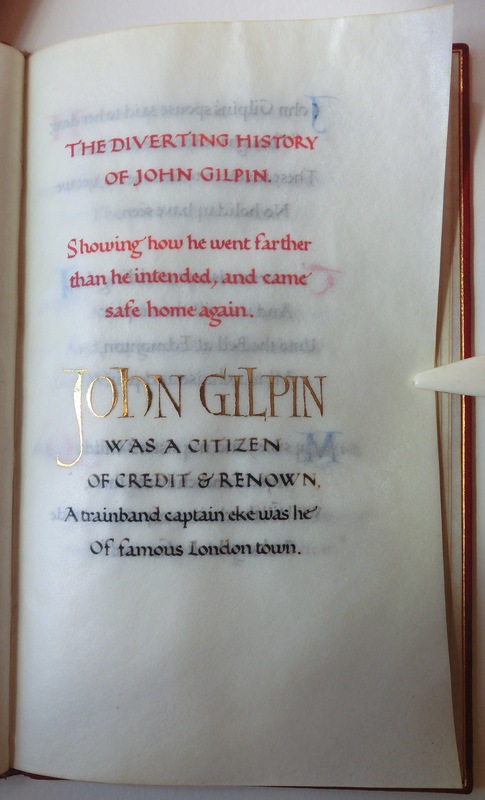 The gesso is usually laid exquisitely, with spine-tingling serifs, and the burnish of the gold leaf enviable. I have been shown and have been given permission to feature this book which has been previously unknown. 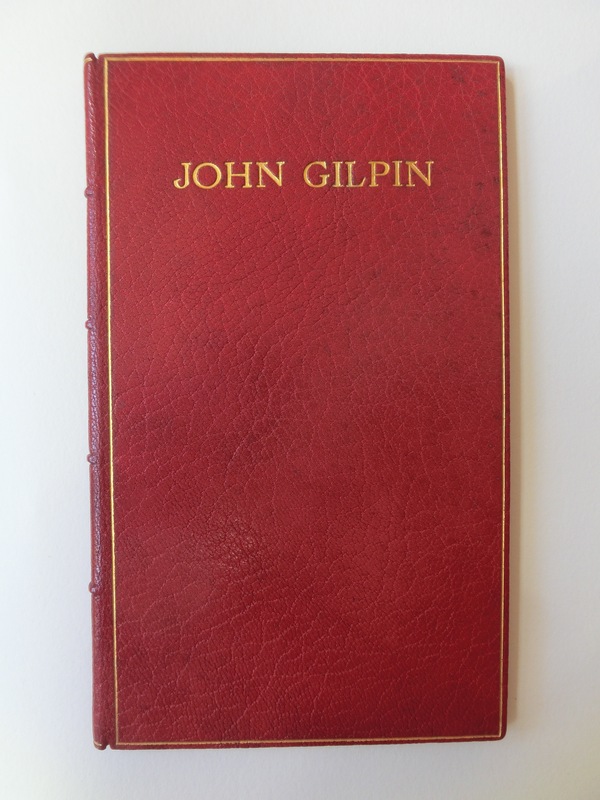 The book is a hand-written copy of the poem ‘John Gilpin’ and was written for the granddaughter of Dr R A Holmes (see right). 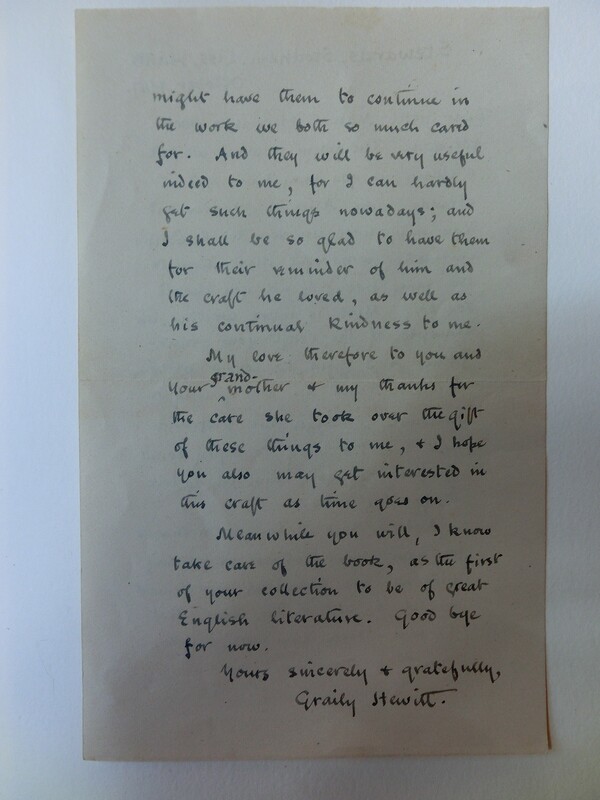 He was a student of Graily Hewitt and they corresponded until the Dr’s death. Because his granddaughter had shown an interest in what the Dr did as a hobby (although a very competent ‘hobbyist’!) he left his desk and all his tools, materials and equipment to her. 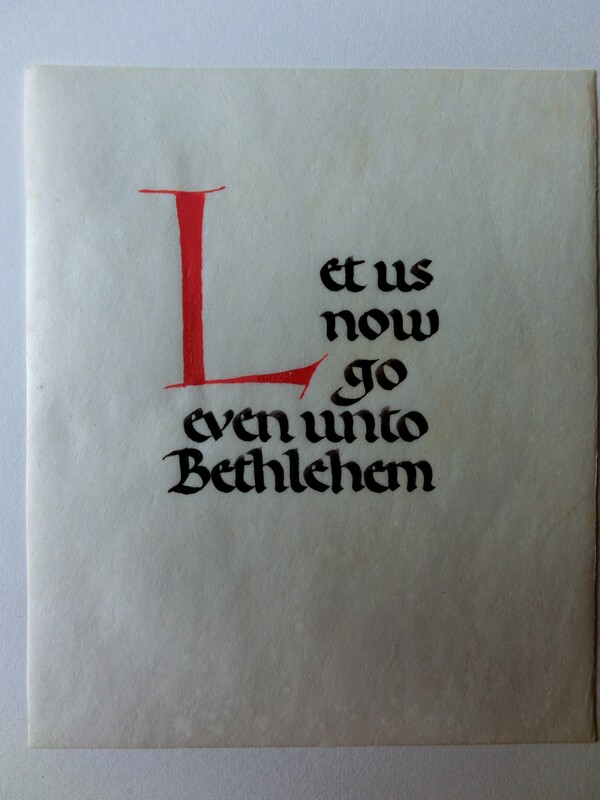 During the war, vellum, parchment, gold and pigments were scarce, and the granddaughter was asked if Graily Hewitt could have some of the calligraphy materials that had been left to her. She agreed and this book was sent to her as a thank you. 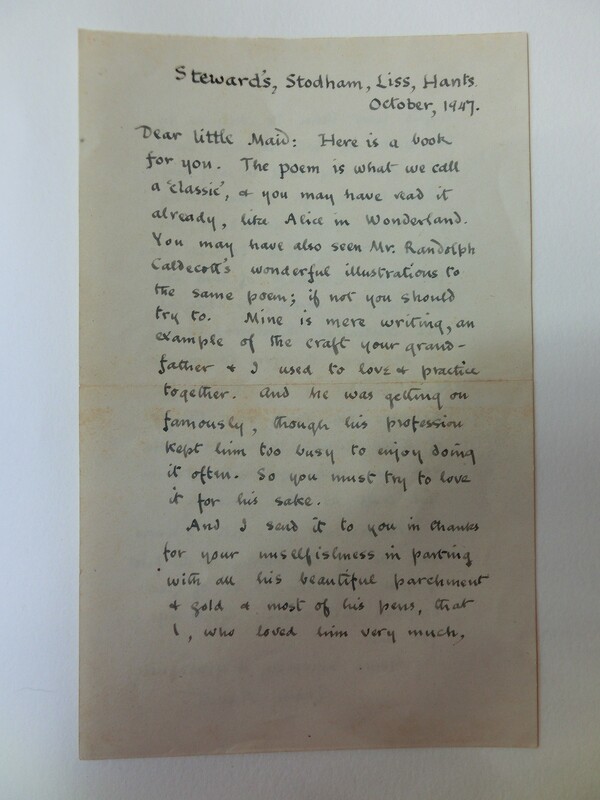 The accompanying letter written by Graily Hewitt is delightful, and starts ‘Dear Little Maid’. 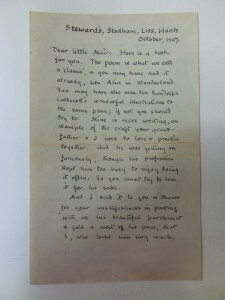 It explains that the book is ‘mere writing’ but what ‘your grandfather and I used to love and practice together’. He goes on to say that her grandfather ‘was getting on famously, though his profession kept him too busy to enjoy doing it often’. Graily Hewitt then says that it is in thanks for her ‘unselfishness in parting with all his beautiful parchment and gold and most of his pens, that I, who loved him very much, might have them to continue in the work we both so much cared for … I can hardly get such things nowadays; and I shall be so glad to have them for their reminder of him and the craft he loved, as well as his continued kindness to me’. The illumination is just perfect, even looked at under magnification. The poem is written on parchment, not vellum, being Graily Hewitt’s preferred writing surface (for the different between the two see here), and so the writing isn’t always as sparklingly fine as it can be on vellum, but it shows the hand of a great master nevertheless. 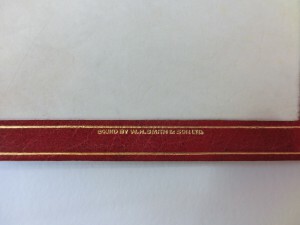 The book is bound in fine red leather on raised bands, evident on the spine. The title is gold blocked and there is a simple narrow gold border around the front and back covers. 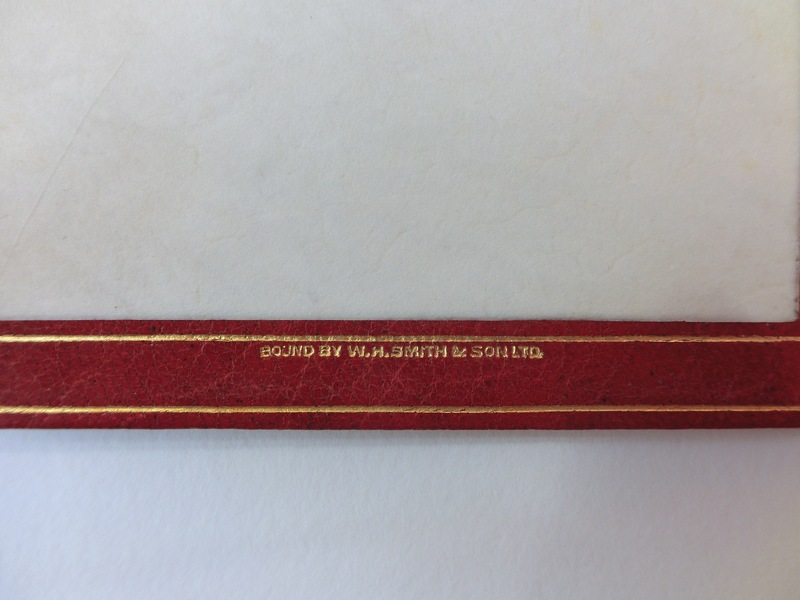 At the back of the book the name of the binder is recorded as ‘W H Smith’. This is now a newsagents, bookseller and stationers in the UK. It may seem strange to think that they once did such a fine binding. 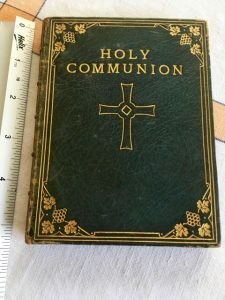 Dr Christopher de Hamel of Corpus Christi College, Cambridge has told me that Douglas Cockerell used to do most of the binding for W H Smith, so perhaps this slim volume has a link with another great man. 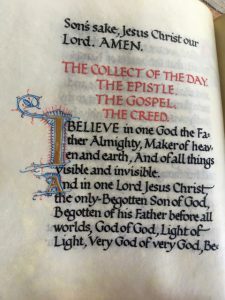 This entry was posted in Blog, Calligraphy and lettering, Craft, Interesting stuff, Manuscripts and tagged Christopher de Hamel, Douglas Cockerell, gilding, Graily Hewitt, parchment, vellum on 15 August 2016 by Patricia. 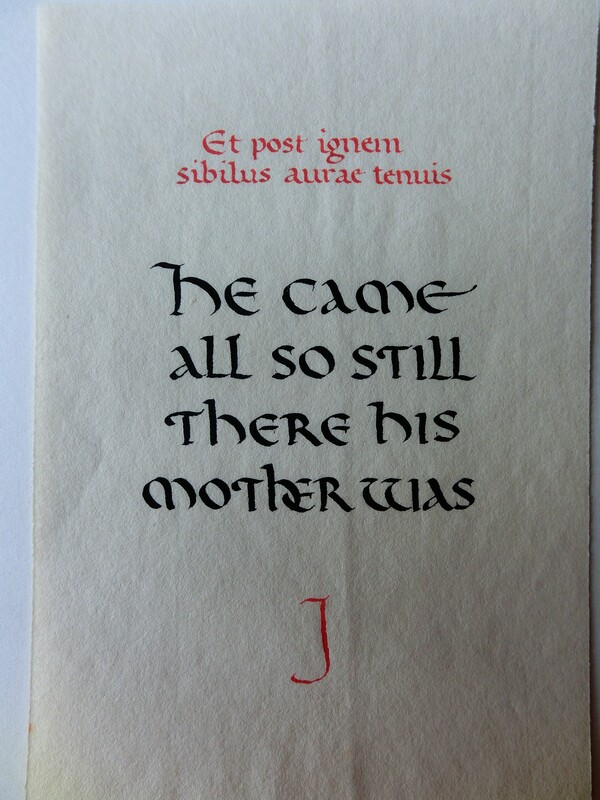 Graily Hewitt was one of the first students to be taught calligraphy by Edward Johnston at the beginning of the last century and did a great deal to advance the knowledge and practice of gilding using gesso and leaf gold. 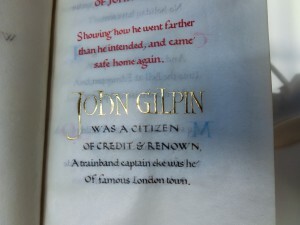 In fact he wrote the ‘Illumination’ section in Johnston’s book – Writing, Illuminating and Lettering, as well as writing his own book Lettering for Students and Craftsmen, published in 1930. 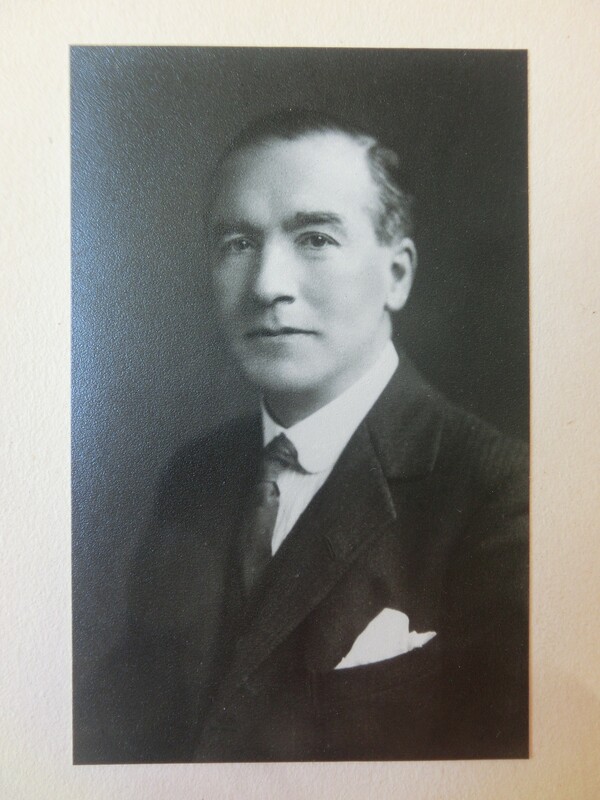 Graily Hewitt taught at both Camberwell School of Art as well as the Central School, continuing at the latter until the 1920s and 1930s. 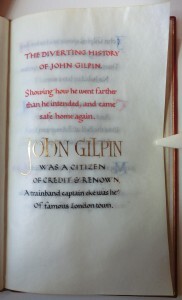 Graily Hewitt did a great deal, indeed it could be said was crucial, in the revival of gilding on gesso. 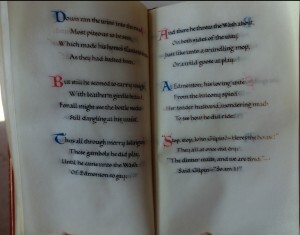 He wrote out the Rubaiyat of Omar Khayyam using a different gesso recipe for each page. This was bound into a small volume, and with it he gave details of the recipes and the results in another volume. Both are now in the British Library. 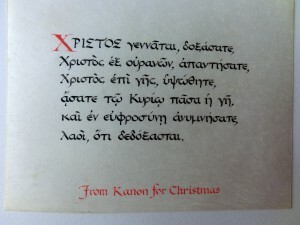 The examples of his work here are the ‘Christmas cards’ he sent to one of his pupils, ‘the Doctor’. 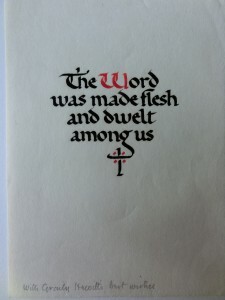 Each is written on parchment, sheepskin, and are in black and red only. However most, as with this one on the right, are striking! 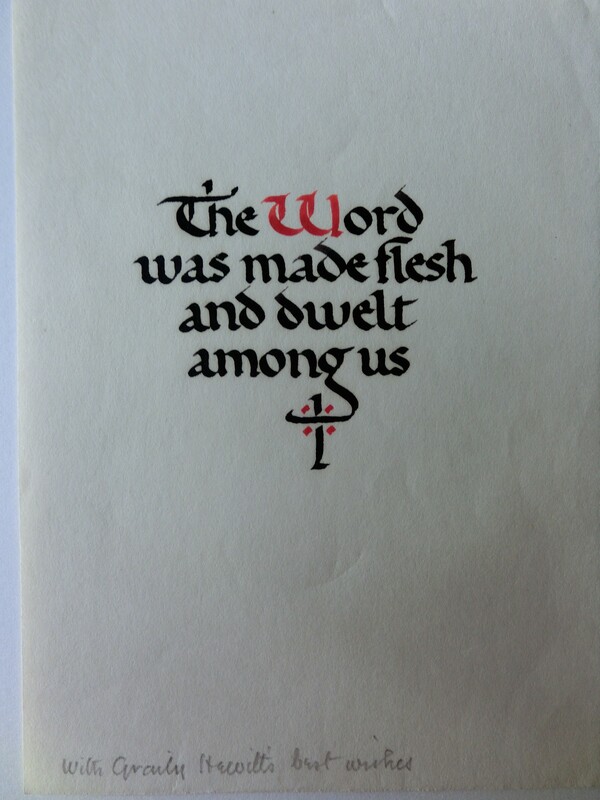 It is surprising how often something simple is the best solution and black and red work so well together. These pieces were written by Graily Hewitt in his twilight years – he died aged 88 on 22nd December 1952 – and was writing up until his death. 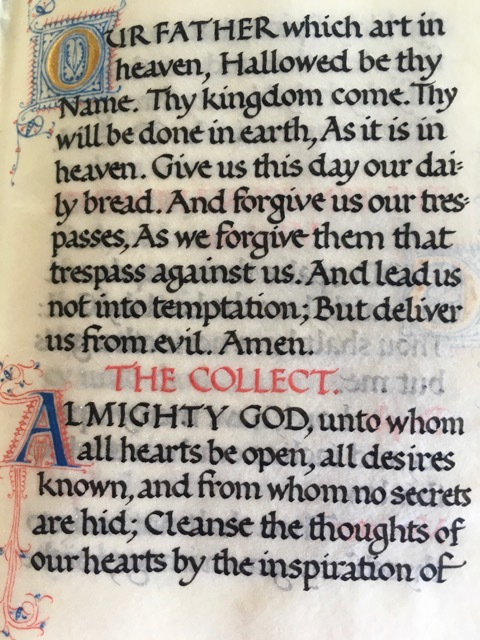 Although the lettering is strong, not all of it, in my view, is totally successful – the ‘h’ and ‘e’ overlap on the right being a case in point. I would suggest that it brings a density to the design which is not balanced elsewhere, although it does avoid a too long line, which may have been the intention. However, other designs and letter combination are just delightful. 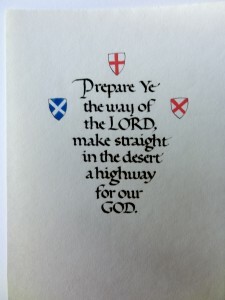 The balance of this lightweight cross on the right and the text, resulting in a shield-shape is particularly pleasing. 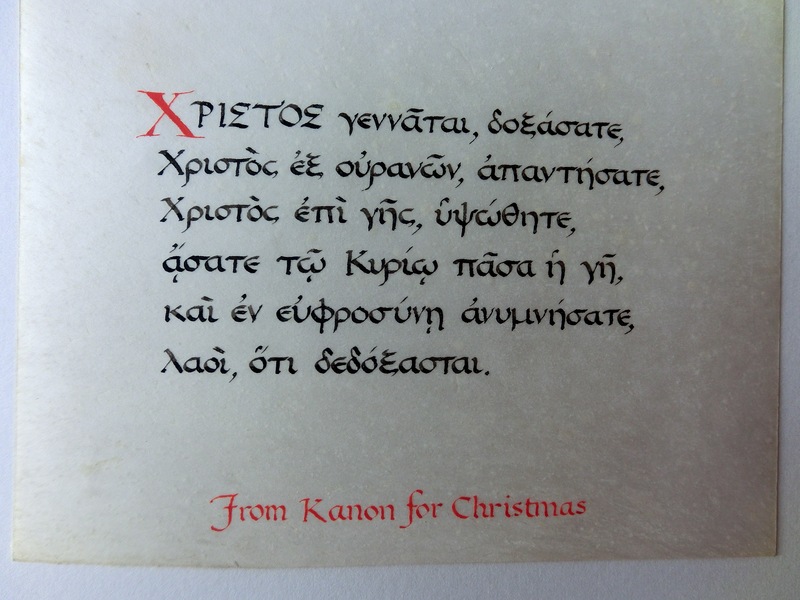 And the placing of the red dots making a tastefully decorated cross with the tail of the ‘g’, in this piece that I used in my free online newsletter, neatly balances the red letter ‘w’ on the first line. 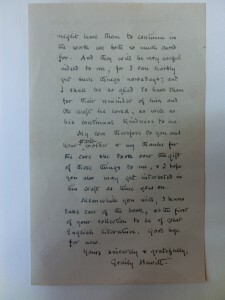 You can also see Graily Hewitt’s neat and legible handwriting at the bottom. I intend to write more on Graily Hewitt in a future blog and newsletter. 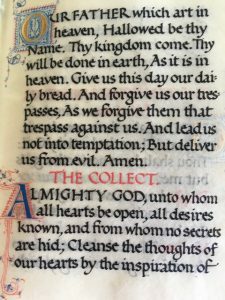 This entry was posted in Blog, Calligraphy and lettering, Interesting stuff and tagged calligraphy, Edward Johnston, Graily Hewitt on 17 January 2016 by Patricia.